The objective of this study was to detect ultrastructural changes in myocardium related to collagen content by ultrasound tissue characterization in patients with chronic kidney disease (CKD) and in uncomplicated hypertensive control subjects. In 25 hemodialysis (HD) patients, in 25 patients with moderate to severe chronic renal failure (CRF), and in 10 patients with essential hypertension (EH) and normal renal function matched for age, BP, and left ventricular mass index, left ventricular anatomy and function were evaluated by conventional echocardiography, and integrated backscatter signal (IBS) was analyzed by acoustic densitometry. IBS mean reflectivity increased from 48% in patients with EH to 56% in patients with CRF to 62% in HD patients (ANOVA P < 0.01). IBS mean cyclic variation was progressively increased from 4.35 ± 1.2 dB in HD patients to 5.27 ± 0.90 in patients with CRF to 6.50 ± 1.6 dB in patients with EH (ANOVA P < 0.01). At multivariate analysis, IBS mean reflectivity was positively related to age and serum creatinine (β 0.351, P = 0.036; and β = 0.408, P = 0.016, respectively). IBS mean cyclic variation was inversely related to age and serum creatinine (β = −0.274, P = 0.025; and β = −0.262, P = 0.025, respectively) and positively related to left ventricular midwall fractional shortening and transmitral E/A ratio (β = 0.269, P < 0.05; and β = 0.314, P < 0.001, respectively). The data support the hypothesis that interstitial collagen deposition may appear early in the course of CKD and suggest that acoustic densitometry may represent a useful tool for the assessment of myocardial tissue changes in patients with CKD. Left ventricular hypertrophy (LVH) is an independent predictor of cardiovascular morbidity and mortality in patients with ESRD as well as in hypertensive patients, in patients with coronary artery disease, and in the general population (1). It has been demonstrated that changes in LV mass index (LVMI) over time are associated with cardiovascular prognosis (2–4), and LVH is currently considered an important intermediate end point in the treatment of hypertensive patients (5,6). A greater prevalence of LVH has been reported in patients with chronic renal failure (CRF) (7), possibly contributing to the greater risk for cardiovascular events in these patients (8,9). Experimental studies have demonstrated that the typical changes in uremic cardiomyopathy are increased cardiac size, interstitial and perivascular fibrosis, reduced capillary density, and thickening of intramural myocardial arterioles (10). Acoustic densitometry is a noninvasive tool for the evaluation of myocardial tissue characteristics and provides an integrated on-line capability to measure, display, and analyze the average acoustic image intensity within a user-specified region of interest (ROI). Experimental studies have suggested that integrated backscatter (IBS) measures may be related to myocardial collagen content (11–14). In humans, ultrasonic backscatter indices have been shown to be related to myocardial collagen content as assessed by endomyocardial biopsy (15–18). Therefore, we considered it worthwhile to analyze myocardial ultrasonic backscatter (IBS) in patients who had CRF and were undergoing hemodialysis, in patients with mild to moderate CRF, and in patients with essential hypertension with comparable age, BP values and LVM to evaluate whether interstitial collagen deposition as evaluated by acoustic densitometry may appear early in the course of chronic kidney disease (CKD). Sixty patients were included in the study: 25 consecutive patients who had ESRD and were undergoing hemodialysis (HD) at the Department of Nephrology of our University Hospital, 25 patients with moderate to severe CRF (serum creatinine ≥1.3 mg/dl in women and ≥1.5 mg/dl in men and estimated GFR [eGFR; modified Modification of Diet in Renal Disease (MDRD) formula] <60 ml/min per m2), and 10 control patients with essential hypertension (EH). Patients with CRF and EH were selected from consecutive patients attending the Hypertension Unit at our University Hospital. Patients with previous cardiovascular disease were excluded. patients with EH with comparable LVMI were selected to avoid the confounding effect of the increase of LVM on IBS measures, because an increase in IBS absolute values and a reduction of IBS cyclic variation (CV) has been described in patients with EH with markedly increased LVM (19). BP was measured by the same physician with a mercury sphygmomanometer. Three measurements were taken in a sitting position after 10 min of rest. The diagnosis of EH was determined according to European Society of Hypertension–European Society of Cardiology (ESH-ESC) guidelines (an increase in systolic BP ≥140 mmHg and/or diastolic BP ≥90 mmHg) (5). In all patients, an informed consent was obtained according to the Declaration of Helsinki. Venous blood samples were taken with the participants in sitting position after fasting for 12 h for standard hematology and serum biochemistry tests. GFR was estimated by the simplified MDRD formula: 186.3 × [serum creatinine exp(−1.154)] × [age exp(−0.203)] × (0.742 if female; ml/min per 1.73 m2). All patients underwent standard echocardiographic evaluation using a Philips Sonos 5500 echocardiographic unit equipped with a broadband sector transducer (S4 fusion imaging 2 to 4 MHz, Eindhoven, The Netherlands). The examinations were performed in the morning with the patient in supine left lateral decubitus after 20 min of rest; in all HD patients, the examination was performed shortly after HD. The procedure for visualization and interpretation of the LV structure that was followed was previously described (2). The LV internal dimensions, interventricular septum (IVS), and posterior wall (PW) thickness were measured according to the recommendations of the American Society of Echocardiography (20). Echocardiographic tracings were calculated blindly by two expert independent readers, and the average measurements were considered. Relative wall thickness (the ratio of PW thickness to one-half LV internal dimension) was calculated, and values >0.44 were considered to indicate LV concentric geometry (21). The Penn Convention was used to calculate LVM by an anatomically validated formula (23); LVM was indexed by body height to the 2.7 power (23). LV systolic function was estimated by both endocardial fractional shortening and midwall fractional shortening, as previously reported (24). Transmitral flow velocity profile was evaluated by the Doppler technique, with the sample volume placed at the tips of mitral leaflets from the apical four-chamber view, and the peak early (E wave) flow velocity, peak late (A wave) flow velocity, and the deceleration time of the E wave were measured. Outlines of transmitral Doppler flow patterns recorded at mitral annulus were traced to measure early and late diastolic filling integrals (25). LV isovolumic relaxation time was also measured by Doppler echocardiography, with the sample volume positioned between the LV outflow tract and the anterior mitral leaflet. Diastolic dysfunction was defined according to the European Society of Cardiology Working Group on Diastolic Heart Failure Criteria (26). Acoustic densitometry analysis was performed with the commercially available software package included in the ultrasound system. Images were acquired in parasternal long-axis view (septum and PW were kept almost perpendicular to the ultrasound beam), at a frame rate of 25 Hz, and stored on optical disks. The signal was sampled with the ROI (21 × 21 pixels) placed at the middle portion of the IVS, of the PW, and of the pericardium. All of the digital images were analyzed off-line blindly by one experienced reader. The position of the ROI was adjusted frame by frame to analyze the same region of myocardium throughout the cardiac cycle, and care was taken to exclude specular echoes that arose from interfaces between myocardium and blood. Analysis of IBS amplitude and absolute systo-diastolic variation of backscatter were considered. IBS reflectivity at IVS and PW were calculated as the ratio between the mean IBS values and pericardial IBS × 100. Mean reflectivity (the mean of IVS and PW reflectivity) was also calculated. IBS analysis was performed by the same operator in all patients. Reproducibility of the IBS measurements was tested in 20 patients by assessment of absolute IBS values and CV in two different acquisitions. The mean difference between the two series of acquisitions performed by the same operator was 0.18 ± 0.45 db for myocardial IBS and 0.09 ± 0.91 dB for CV of IBS (averaged variation 2.5 and 9.7%, respectively). Data were stored and analyzed with SPSS for Windows Statistical Software (SPSS, Chicago, IL). All data are expressed as mean ± SD, unless otherwise stated. 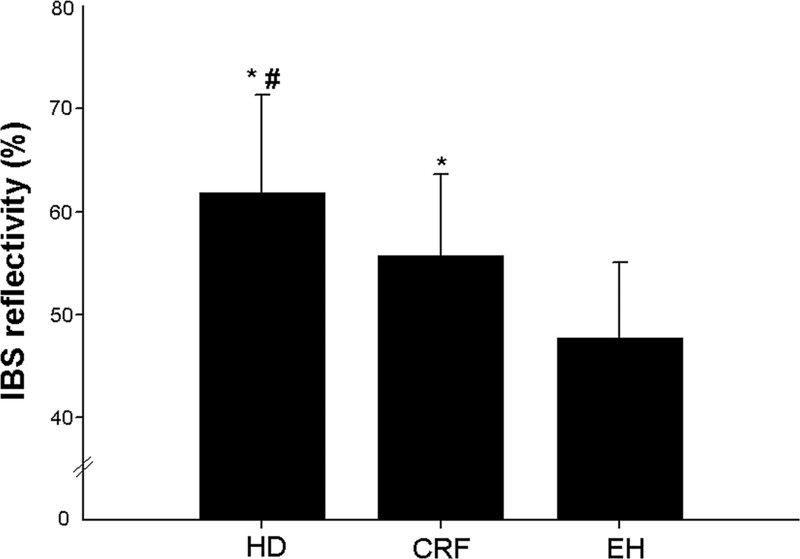 One-way ANOVA and Scheffe post hoc test were used to evaluate differences among groups. Frequency distribution was analyzed by χ2 test. Bivariate correlations were evaluated by the Pearson correlation coefficient; multivariate correlations were evaluated by linear regression analysis. P < 0.05 was considered statistically significant. There was no difference in age, gender distribution, and BP values among the three groups of patients (Table 1). Serum creatinine was, by definition, higher in HD patients and in patients with CRF in comparison with patients with EH, and eGFR was significantly lower in HD patients and in patients with CRF in comparison with patients with EH. No patient with EH had an eGFR <60 ml/min per m2. Serum uric acid was significantly higher in HD patients and in patients with CRF, whereas plasma lipid profile and plasma glucose levels were comparable in the three groups. Hemoglobin levels were slightly but not significantly lower in HD patients. Antihypertensive treatment consisted of a combination of drugs in 84% of patients. Angiotensin-converting enzyme inhibitor or angiotensin II receptor blocker use was comparable in the three groups (76% in HD, 84% in CRF, 80% in EH; NS). LVMI was not different in the three groups (hypertension controls were selected to obtain groups with comparable LVMI). In HD patients, LV internal dimensions tended to be lower and relative wall thickness tended to be higher, indicating a trend (although statistically nonsignificant) to a more concentric geometry. Left atrial dimensions were comparable in the three groups (Table 2). No significant differences among groups were observed for endocardial fractional shortening. Midwall fractional shortening increased from 12.9 ± 3.3 in HD patients to 14.7 ± 3.4 in patients with CRF to 16.0 ± 3.9 in patients with EH (P < 0.05; Table 2). There was no statistically significant difference in the ratio of E and A transmitral flow velocities in the three groups. E wave deceleration time increased from 193 ± 42 ms in patients with EH to 219 ± 40 ms in patients with CRF to 249 ± 66 ms in HD patients (P < 0.05). LV isovolumic relaxation time progressively increased from 78 ± 15 ms in patients with EH to 103 ± 25 in patients with CRF to 113 ± 25 in HD patients (P < 0.05). The prevalence of diastolic dysfunction was significantly greater in HD patients in comparison with patients with EH (76 versus 10%; χ2 P = 0.001) and with patients with CRF (76 versus 48%; χ2 P < 0.05) and in patients with CRF as compared with patients with EH (48 versus 10%; χ2 P < 0.05). IBS reflectivity measured at the IVS was progressively increased from 51% in patients with EH to 62% in patients with CRF to 72% in HD patients (P < 0.01). PW IBS reflectivity also was increased from 44% in patients with EH to 49% in patients with CRF to 52% in HD patients (NS). The calculated mean of the values that were observed at the IVS and at the PW (“mean reflectivity”) was progressively increased from 48% in patients with EH to 56% in patients with CRF to 62% in HD patients (P < 0.01; Figure 1). Integrated backscatter (IBS) mean reflectivity. HD, hemodialysis patients; CRF, patients with chronic renal failure; EH, patients with essential hypertension. *P < 0.05 versus EH; #P < 0.05 versus CRF. IBS CV that was measured at the IVS progressively increased from 4.02 ± 1.13 dB in HD patients to 4.88 ± 1.27 dB in patients with CRF to 5.81 ± 1.16 dB in patients with EH (P < 0.01). Similar results were obtained at the PW, with a progressive increase of IBS CV from 4.68 ± 1.61 in HD patients to 5.86 ± 0.89 in patients with CRF to 7.18 ± 2.69 in patients with EH (P < 0.01). The calculated mean of CV at the IVS and at the PW (mean CV) progressively increased from 4.35 ± 1.2 dB in HD patients to 5.27 ± 0.90 in patients with CRF to 6.5 ± 1.6 dB in patients with EH (P < 0.01; Figure 2). IBS mean cyclic variation. *P < 0.05 versus EH; #P < 0.05 versus CRF. At univariate analysis, IBS mean reflectivity was positively related to age and serum creatinine (r = 0.316, P < 0.01; and r = 0.430, P < 0.001, respectively) and negatively related to eGFR (r = −0.518, P < 0.001). IBS mean CV was negatively related to age (r = −0.275, P < 0.05) and serum creatinine (r = −0.404, P < 0.001) and positively related to eGFR (r = 0.518, P < 0.001), transmitral E/A ratio (r = 0.328, P = 0.01), and LV midwall fractional shortening (r = 0.338, P < 0.01). At multivariate analysis, IBS mean reflectivity was positively related to age (β 0.351, P = 0.036) and serum creatinine (β = 0.408, P = 0.016), whereas IBS mean CV was inversely related to age (β = −0.274, P = 0.025) and serum creatinine (β = −0.262, P = 0.025) and positively related to eGFR (β = 0.408, P < 0.001), transmitral E/A ratio (β = 0.314, P < 0.001), and LV midwall fractional shortening (β = 0.269, P < 0.05). In patients with diastolic dysfunction, IBS mean reflectivity was significantly higher (54 versus 59%; P < 0.05) and IBS mean CV was significantly lower (4.7 ± 1.3 versus 5.4 ± 1.3; P < 0.05) than in patients with normal diastolic function. The main finding of this study is represented by the significant difference in echocardiographic indices of fibrosis observed in patients with CRF and in HD treatment in comparison with control subjects with EH. In experimental studies, IBS absolute values have been shown to be reliable indices of LV fibrosis. In addition, they have been shown to reflect myocardial collagen content as assessed by endomyocardial biopsy in humans (15,16,18). It has been demonstrated that even mild reductions in renal function are associated with a greater prevalence of LVH (27,28); the increase in IBS reflectivity that was observed in our study also indicates an early increase in LV collagen deposition, beginning well before the development of ESRD. In fact, the increase in IBS reflectivity was progressive, with intermediate values in patients with mild to moderate CKD and with the highest values in HD patients. Our findings with a noninvasive technique are concordant with previous data demonstrating a significant increase in interstitial collagen content in uremic cardiomyopathy and add further information to the early involvement of the left ventricle in the less advanced stages of kidney disease. Another interesting finding in our study is represented by the lower IBS CV that was observed in the two groups of patients with CKD in comparison with patients with EH. As described for IBS reflectivity, the reduction in CV was progressive, with the lowest values in HD patients. CV reflects a complex phenomenon and is significantly influenced by myocardial fiber orientation during the cardiac cycle, by myocardial contractility, and by collagen content. Already in 1985 Wickline et al. (29) observed in open-chest dogs that a reduced IBS CV may be paralleled by a reduction in LV contractile performance. At the same time, IBS CV was found to be significantly and inversely related to the percent fibrosis area as assessed by endomyocardial biopsy in patients with dilated cardiomyopathy (17) and to the myocardium/fibrosis ratio in patients with aortic stenosis (18). 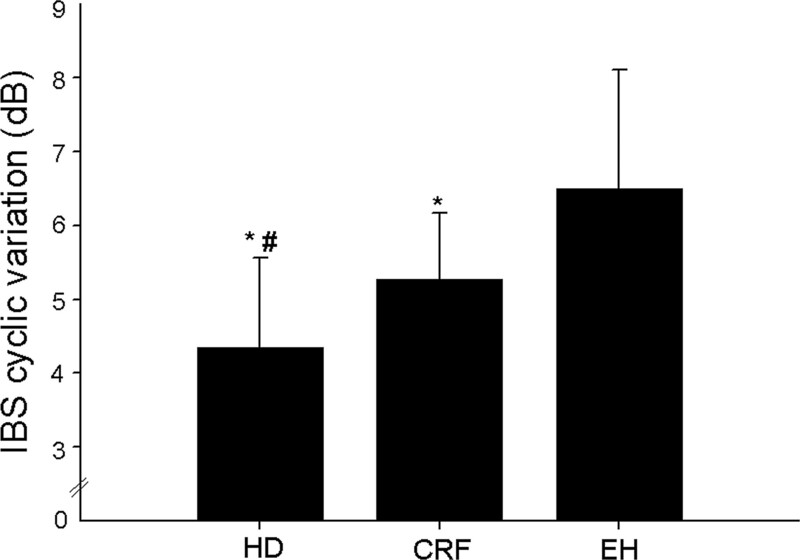 Furthermore, in patients with EH, a decreased CV of backscatter signal is associated with an increase in serum procollagen type I C-peptide, a specific circulating marker of cardiac collagen content (30). In our study, the modest reduction of IBS CV that was observed in patients with CRF and the more relevant decrease of CV IBS that was observed in patients with ESRD, as well as the significant correlation with indices of systolic function, might reflect a progressive impairment of LV contractile performance, possibly associated with an increase in myocardial collagen content. Our data expand previous findings in patients with CKD. Mizushige et al. (31) observed a reduction in IBS CV in 18 patients who were undergoing HD in comparison with 11 normotensive control subjects; however, the significant difference in LVMI between groups could have influenced the results. In another study, Akar et al. (32) observed a reduction in IBS CV in patients with ESRD, in comparison with both normotensive control subjects and patients with EH with normal renal function. In both studies, the authors did not report data on IBS reflectivity, limiting their observations to IBS CV, and did not include patients with less advanced stages of renal disease. Some limitations deserve considerations. First, in our study, we were not able to correlate IBS measures with histologic data from endomyocardial biopsies for ethical reasons. The results that were obtained in patients with dilated cardiomyopathy (15–17) and aortic stenosis (18) suggest, however, that ultrasonic tissue characterization may be a reliable indicator of the degree of myocardial fibrosis. As an alternative to endomyocardial biopsy, late gadolinium-enhancement cardiovascular magnetic resonance (MR) has been proposed as a useful tool for the noninvasive evaluation of myocardial fibrosis; unfortunately, cardiac MR was not performed in this study. Antihypertensive treatment, in particular with drugs that interact with the renin-angiotensin-aldosterone system, may influence myocardial structure. All of the patients in this study were treated with antihypertensive drugs, although the proportion of patients who were taking angiotensin-converting enzyme inhibitors or angiotensin receptor blockers was similar in the three groups and a strong influence of treatment on our results seems unlikely. Our findings may give some insights into the underlying mechanisms of the elevated risk for cardiovascular events in patients with renal dysfunction. In fact, the precocity of the impairment of LV structural and functional properties in patients with CKD might contribute to the increased risk for cardiovascular events that are observed in the presence of even mild derangements of renal function. It is interesting that a reduction in myocardial IBS CV is an independent predictor of cardiovascular events in patients with primary amyloidosis (45). Our data support the hypothesis that interstitial collagen deposition, one of the typical features of uremic cardiomyopathy, may appear early in the course of CKD and suggest that acoustic densitometry may represent a useful tool for the assessment of myocardial changes in patients with CKD. A more extensive use of myocardial IBS analysis, a noninvasive and widely available technique with relatively low cost, might be of value in the evaluation and follow-up of patients with CKD. Additional studies are needed to clarify further the clinical and prognostic significance of IBS in patients with CKD as well as the effects of various treatment strategies on LV structure and function. Refining Patterns of Left Ventricular Hypertrophy Using Cardiac MRI: "Brother, Can You Spare a Paradigm?"